[box]Over My Shoulder Foundation (OMSF) is a non-profit organization co-founded by Patti Austin and Dawn Carroll to promote mentoring and Mentorology through music and design. Over My Shoulder Foundation hails Mentorology, the art and science of mentoring, as the number-one priority as they move forward producing live events which bring together industry leaders in order to pay tribute to great mentors and put the spotlight on the importance of mentoring. Think of “Mentoring”, “Music” and “Design” together. From LA to Boston, Berlin and beyond, Over My Shoulder Foundation Co-Founders Dawn Carroll and Patti Austin have been sharing the mentoring message of Designing the Next Generation in 2013. Tyler and Joe Perry. 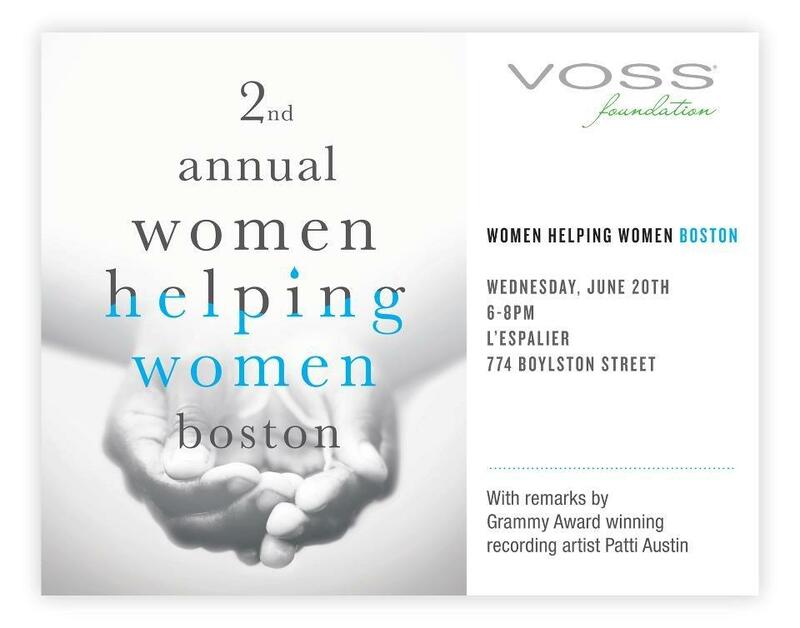 On that night, Patti will perform the song that started OMSF on the path of the mentoring work. OMSF partnered with CUMAR Marble & Granite to create The Boston Globe’s Design New England Magazine MIDDIE (Mentors in Design) awards. The MIDDIES salute design professionals in interior design, architecture, building, landscape design, and related fields, who share their time, expertise, and wisdom with the next generation. OMSF launched the inaugural “Designing the Next Generation” event in 2012 with Cumar Marble and Granite to expand the mentoring conversation nationally. The Inspirational Evening of Mentoring Story and Song at the Liberty Hotel in Boston featured speakers Stephen Powell (Executive Director, Mentoring USA), Ted Fujimoto (Founder, The Right to Succeed Foundation) and keynote speaker Attorney Richard (Rick) Dyer who was introduced by Attorney Gary Greenberg of GreenbergTruarig. 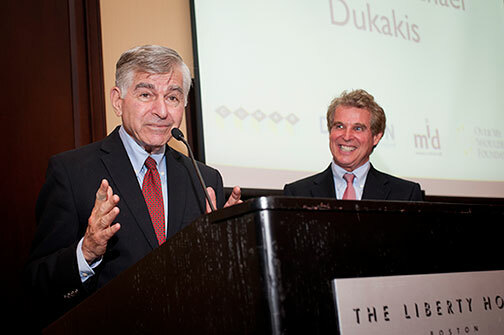 Attorney Dyer presented former Presidential Candidate, Governor Michael Dukakis, with a stunning award designed by Cumar Inc. thanking him for the mentoring that allowed him to turn his life around. The audience was graced with beautiful musical performances by Patti Austin, Charlie Farren, Robin Lane, Hal Lebeaux and Julie Silver. OMSF partnered with well-known design brands like the prestigious Poggenpohl kitchen design studios and Mitchell Gold + Bob Williams furniture showrooms in 2012 to promote mentoring in design. The events are just a hint of what is to come nationally as individuals from the worlds of mentoring, music and design are gathering to recognize the importance of Mentorology and help OMSF spread the concept for future generations. One little song called Over My Shoulder has brought the world a little closer and has us all paying close attention to mentoring. The mentoring song was written by Dawn Carroll, Charlie Farren, Brynn Arens and Barry Orms. 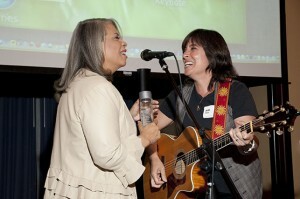 It was first performed by Patti Austin and her mentee, Lianna Gutierrez, as a duet. The message of the song is to mentor, whether older to younger or the other way around – mentoring knows no age. Watch Patti and Lianna perform Over My Shoulder here. As she sat cross-legged in a leopard print blouse, patterned skirt, and high-heeled ankle boots, Kate White told her audience about a time in her life when she identified less as a “fun, fearless female” and more like a rookie. Before she became editor of Cosmopolitan, a role she held for 14 years, White said she was just as insecure as the many other girls who flock to New York City in pursuit of their dreams. 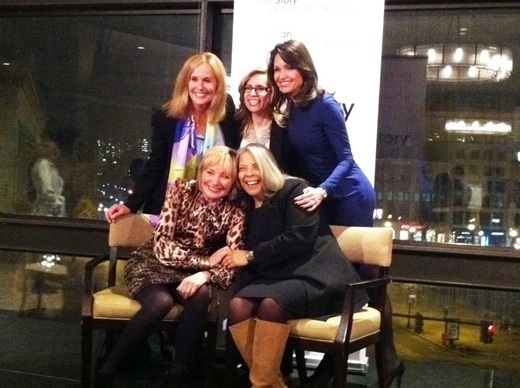 Last night, about 75 women gathered at the Westin Hotel at Copley Place to hear stories from White, a magazine editing veteran and best-selling author, and Patti Austin, a Grammy-winning entertainer and co-founder of the mentoring-based Over My Shoulder Foundation. Hosted by Boston Women in Media and Entertainment, The Story Behind Her Success was the first in a original series that gives audiences first-hand accounts of rising to the top in various fields. The organization, formed in 2012, holds networking events and actively tries to find jobs for its members, according to Co-Founder and Executive Vice President Dayla Santurri. Through White and Austin’s conversations with local media professionals and BWME board members Candy O’Terry and Liz Brunner respectively, the women peppered their professional advice with stories that got laughs from the audience. Austin spoke about the time she wore Crocs to accept her Grammy Award, and Kate revealed that getting Kim Kardashian to pose for a Cosmo cover was unsurprisingly easy. Over two hours, they covered topics like their breakthroughs, their challenges, balancing work and personal life, and career shifts. White said that despite the advances women have made over the years, there are still improvements to be made. “I do think that there are some things that women don’t know to do still,” White said after the presentation. During Austin’s storytelling, she spoke frequently of her mentors including Quincy Jones, Dinah Washington, and Sammy Davis Jr., and emphasized how much their guidance shaped her life and career. “You’ve got to have someone who just doesn’t care about anything but you,” she said. In a later interview, Austin said that the United States is lagging in the mentoring mentality. “The rest of the world gets this,” she said, pointing out that apprenticeships are common in other countries. However, White warned attendees that working professionals aren’t always initially eager to help those starting out. Austin added that she tries to instill this message in her music students. White gave similar advice during her presentation, noting that success often comes slowly. After her sit-down, she spoke about her reaction to an intern who asked her how to avoid being bored at her first job. “In the old days, they called that paying your dues. You have to know that you might have to do that,” she said. While both women acknowledged the differences between men and women in the workplace, neither expressed a personal connection with Sheryl Sandberg’s buzzed-about book, Lean In. White said that while she respects the book and thinks that women are inspired by it, she sees the workplace differently. “The movement seems a little earnest for my taste because [to me], a lot of the work world involves being a little scrappy and getting down and dirty sometimes,” she said. After the event, Austin said she was happy she saw diversity in the audience. “What I really loved seeing was that the demographic was really [varied],” she said, emphasizing the range of ages present. Santurri said that White and Austin were the perfect picks for the kick-off event of the Story Behind Her Success. Austin added that being able to mentor and share her stories makes her a better person. 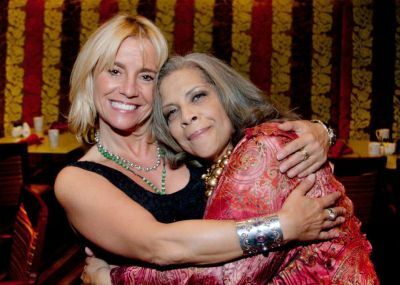 Patti Austin is set to teach at UCLA’s Herb Alpert School of Music as the school’s artist-in-residence for the Thelonious Monk Institute of Jazz Performance program this fall. The program, named after the late jazz pianist Thelonious Monk, is a two-year graduate level full-scholarship program which allows an ensemble of gifted young jazz musicians to study under the tutelage of visiting performance artists. 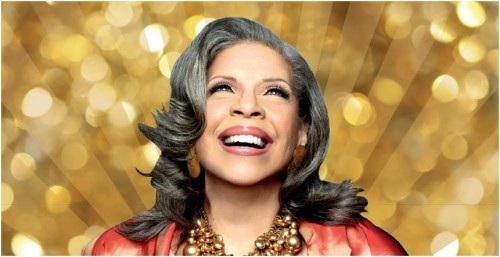 Grammy winner Patti Austin crosses all musical genres, has made 17 solo albums, and has performed her award-nominated hit songs on the GRAMMYS® and the Oscars. As a performer, songwriter and vocalist she has had a star-studded career that began at the age of four, making her one of the most beloved artists the world over and a mainstay on the Billboard Jazz Albums charts. Patti’s extraordinary career continues to cross over boundaries and reach new heights. More information about Patti Austin can be seen on her official website, www.pattiaustin.com. Over My Shoulder Foundation (OMSF) is a non-proﬁt organization founded by Patti Austin and Dawn Carroll to promote mentoring and Mentorology through music and design. Over My Shoulder Foundation hails Mentorology, the art and science of mentoring, as the number-one priority as they move forward producing live events which bring together industry leaders in order to pay tribute to great mentors and put the spotlight on the importance of mentoring. Think of “Mentoring”, “Music” and “Design” together. Now envision Over My Shoulder Foundation uniting those worlds with the guidance of the non-proﬁ t’s two award-winning co-founders. Exciting news is underfoot. The American Society of Interior Designers (ASID) has adopted Over My Shoulder Foundation (OMSF) as its charitable partner in March! 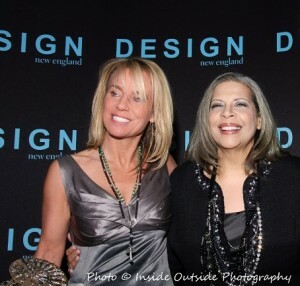 To top it off, both myself and Grammy award winning singing legend Patti Austin (co-founders of OMSF) are being recognized this year for our service in the design community at the New England ASID 2013 Excellence in Design Award gala at the end of March. 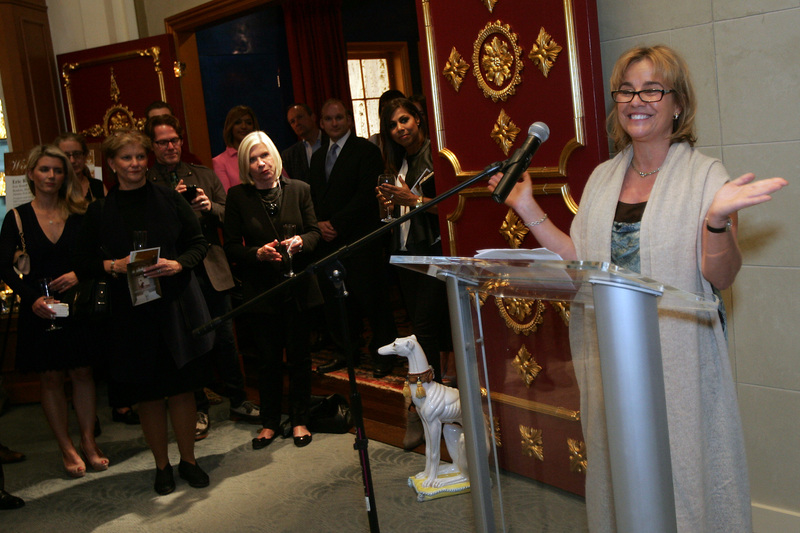 ASID New England President Mary Beth Haggerty says, “I know they have poured their heart and soul into mentoring”. That couldn’t be more true. As some of you may know, Over My Shoulder Foundation is my passion project, a side job that I do because sharing and spreading Mentorology (the art and science of mentoring) is the most important thing I can think of doing with my free time. That being said, doing basically 2 full-time jobs is exhausting! For my “real job” I am a stone designer at Cumar Marble & Granite. Our company is currently in its 8th generation of leadership in stone sourcing and fabrication in Everett, MA. Without mentoring and apprenticeships, the work that we do would not be possible. It is because of both my jobs, Cumar and OMSF, that I am so VERY excited to announce that both I and Patti Austin are being recognized this year for our service in the design community at the New England ASID 2013 Excellence in Design Award ceremonies. Here’s Patti and I at Cumar, being mentored! We are being recognized for bringing mentoring to the forefront of thought in the New England design industry. How have we done it? Well, miracles and a LOT of hard work. We’ve launched major events like Designing the Next Generation, an inspirational evening of mentoring story and songs, and the MIDDIES which are the New England award ceremonies designed to recognize design professionals who share their time, expertise, and wisdom with upcoming generations of designers. With this ASID recognition for the community service we’ve done through OMSF, I am further energized to guide my OMSF Co-Founder Patti Austin (a Grammy Award-winning singing legend and Design Mentee) in the beginnings of her blossoming career as an interior designer. Mentoring, Music and Design are coming together – more and more each day! Please root for Patti, Cumar, Over My Shoulder and I as we continue unraveling the dream we have of spreading our passion for Mentorology through Over My Shoulder Foundation! Thank you to everyone who attended our first annual “Designing the Next Generation” event on June 18th at The Liberty Hotel. With more than 300 of you in attendance, it was a spectacular evening of inspirational stories and song. Our thanks go out to our speakers, including Patti Austin, Attorney Rick Dyer, Governor Michael Dukakis, Ted Fujimoto (Founder of The Right to Succeed Foundation), Stephen Powell ( Executive Director of Mentoring USA), and Mayor of NewtonSetti D. Warren, for all getting to the core about how mentoring and helping others is imperative for our communities and our future. A huge thank you to all our amazing musical performers, including Patti Austin, Charlie Farren, Robin Lane, Hal Lebeaux Boudreau, and Julie Silver. The music you made was a perfect way to make the point about the power of each of us helping another. We will be posting photos and videos on Facebook in the coming days, so check in soon athttp://www.facebook.com/cumarmarbleandgranite and http://facebook.com/overmyshoulderfoundation to take a look (or see what you missed!). We hope the evening was inspirational to you, too! 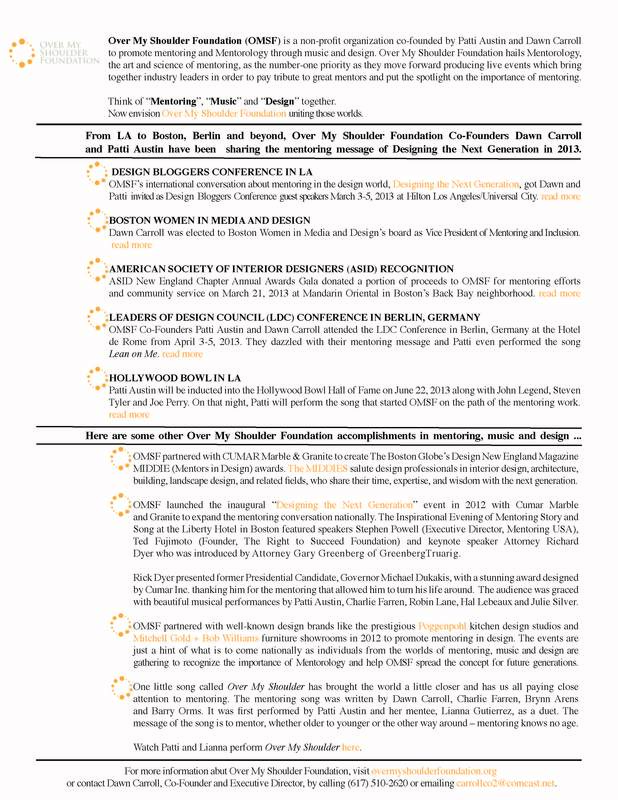 CUMAR Marble & Granite and the Over My Shoulder Foundation‘s goal is to inspire more of us to mentor and support mentoring, so we hope that everyone will take some action to advance the cause of mentoring in Greater Boston and beyond. 3) Nominate someone for a MIDDIE! The MIDDIES (Mentors in Design Awards) salute design professionals in interior design, architecture, building, landscape design, and related fields, who share their time, expertise, and wisdom with the next generation. A nominee might be someone who has mentored you or who you have observed mentoring others during his or her career. The candidate might be your boss, a close colleague, or someone from another discipline who has opened the door to new possibilities. Nominating someone takes just a few minutes, but is a wonderful way to reward them for their mentoring! 4) Donate to the Over My Shoulder Foundation, so we can use your funding to create more editorial, video, and audio to help inspire even more people to mentor! 5) Let us know what action we helped inspire you to take…we want to know if our actions are working, too! We look forward to seeing you at our next event in January 2013! The event represents a wonderful turning point in the story of the foundation. It provided a coming together of organizations who are committed to and believe in the power of mentoring. 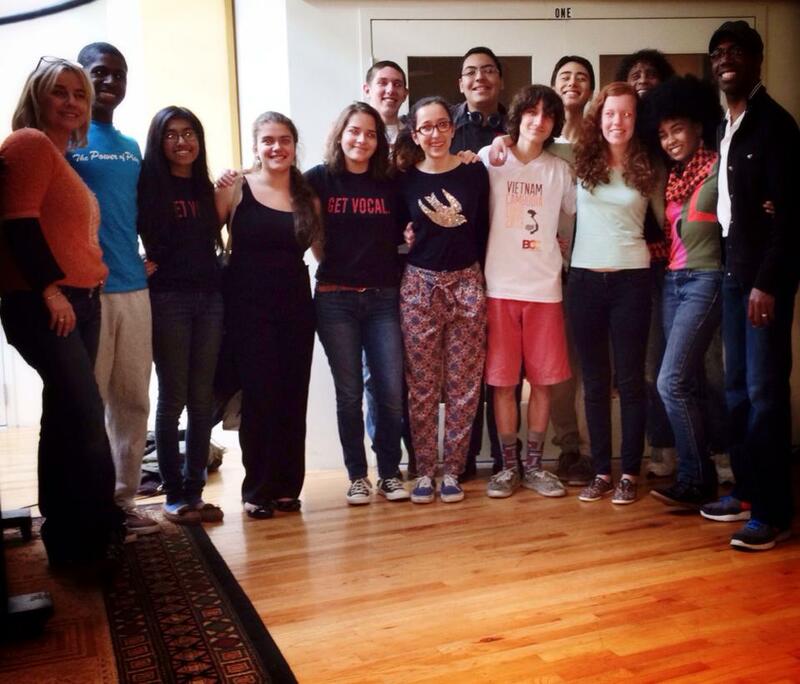 Over My Shoulder has its eyes on the future and hopes to promote mentoring through upcoming events. The Over My Shoulder Project is a national mentoring initiative that uses music to raise awareness about the impact of mentoring both cross-culturally and cross-generationally. The Over My Shoulder Foundation, a cross-cultural and cross-generational mentoring organization, founded by CEO Dawn Carroll and Grammy Winner Patti Austin, honor the dedication and commitment of the students of John H. Reagan HS in Houston, Texas. The Over My Shoulder Foundation is a national mentoring organization that uses music and the media to raise awareness about the impact of mentoring both cross-culturally and cross generationally. The foundation’s goal is to break down barriers that separate generations of people and culture to bolster confidence and wipe out hopelessness. 11/22/2011: BOSTON, MA – January is National Mentoring Month, and January 25 is recognized as “Thank Your Mentor Day.” The power of mentoring positively transforms individuals, families and communities. The Over My Shoulder Foundation (OMSF) believes, as Jimi Hendrix best said, “If there is something to be changed in this world…then it can only be done through music.” While some musicians are already on board, including former Four Non Blondes singer Linda Perry and Grammy Award winning singing legend Patti Austin, OMSF is gearing up for another big year starting January 2012. And OMSF wants your help. The Over My Shoulder Foundation (OMSF), a national mentoring initiative that uses music to raise awareness of the impact of mentoring, or, “Mentorology,” champions the mission “One Less Hopeless Person.” Led by tireless co-founder Dawn Carroll, a Boston-based award-winning stone designer, OMSF is reaching out to a powerful group of people for January’s National Mentoring Month. With music, OMSF plans to incite a dynamic mentoring message and provoke many collaborative efforts that demonstrate how creative minds can use art and music to cut across generations and learn from each other. 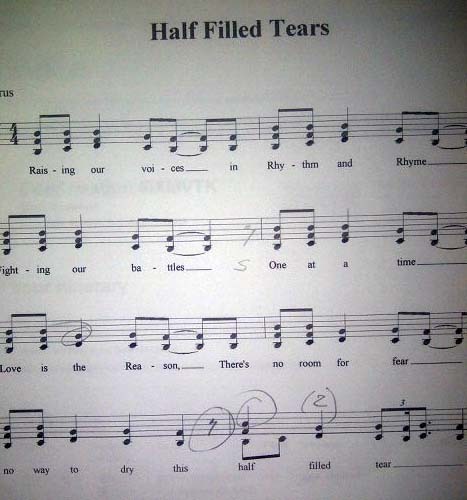 Would you believe that one song started it all? 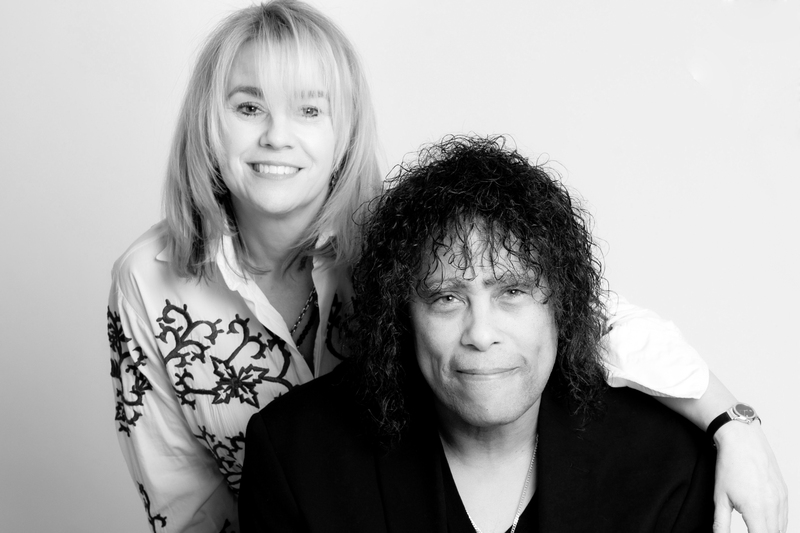 Dawn Carroll wrote the lyrics of Over My Shoulder with brilliant songwriters Charlie Farren and Brynn Arens in honor of a story she had heard 20 years ago when working publicity for Patti Austin. That story is Patti’s story: a girl born with enormous talent and the luck to find a legendary team of mentors (Quincy Jones, Ray Charles and Dinah Washington to name a few) who helped nurture and navigate her toward greatness. Patti performed Over My Shoulder with her mentee Lianna Gutierrez last January at the WCVB TV Channel 5’s inspirational musical celebration to honor the legacy of Dr. Martin Luther King Jr. The awe-inspiring performance by Patti and Lianna was broadcast live to 127 Countries and was re-broadcast for 8 weeks straight!